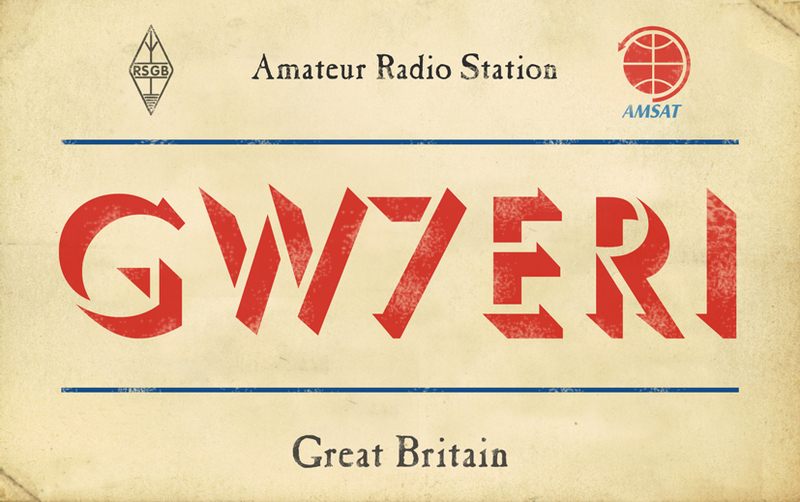 On February 3rd 2006 an experiment long in the planning and eagerly awaited by Radio Amateurs around the world finally took place. 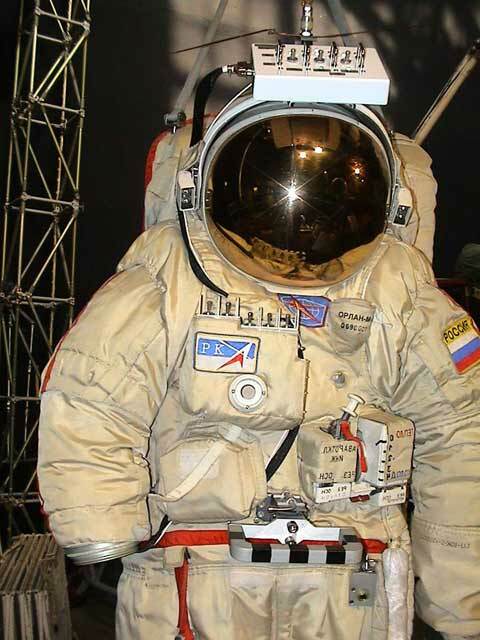 A redundant Russian Orlan space suit was jettisoned into space by astronauts onboard the International Space Station. Packed into the space suit was Amateur Radio equipment comprising a Kenwood TH-K2 hand held transmitter (walkie-talkie) and it's associated hardware i.e. batteries, antenna, etc. 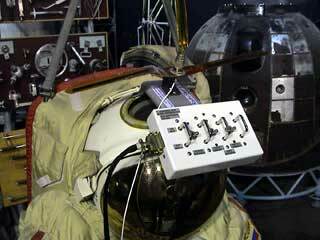 In the photo above you can see the 'whip' antenna which was mounted on the suit helmet. 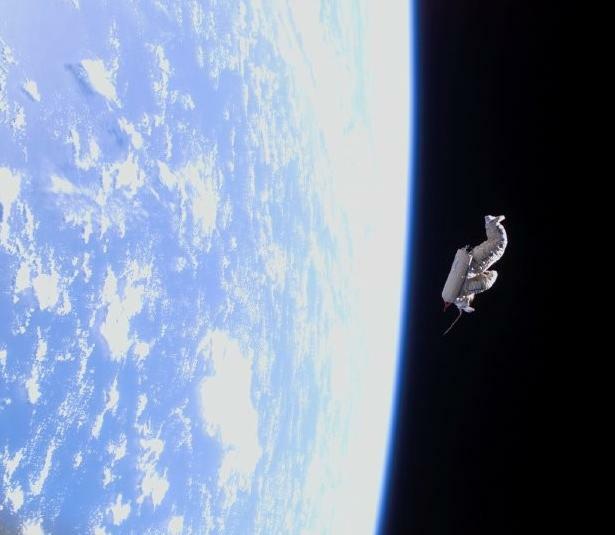 The idea was to use the suit as an orbiting satellite, transmitting a low power voice signal in several languages. These signals would be picked up by ground based stations including, Radio Hams, Schools and Colleges around the world as the suit flew overhead. A Slow Scan Television (SSTV) signal was also generated. SSTV is a television picture built up one line at a time, similar to FAX. 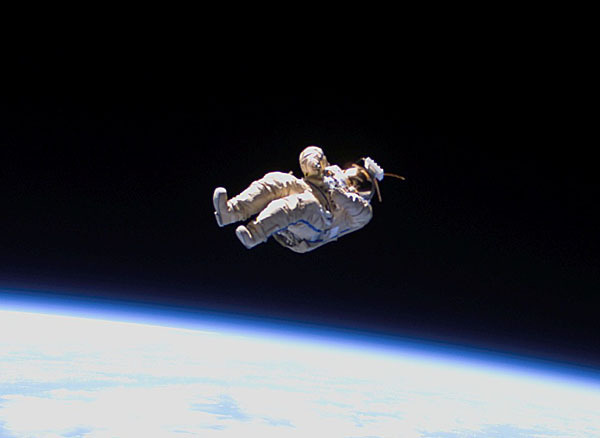 The orbit would gradually decline, causing the suit to 'burn up' as it entered the Earth's atmosphere. The launch was broadcast live on NASA Select TV and was a complete success for Commander Bill McArthur KC5ACR, and the crew of ISS Expedition 12. A low resolution Windows Media Player video clip is available to watch by clicking on the 'Launch Video' link below. The satellite, which was given the call sign RS0RS, unfortunately suffered battery problems, and the signal was not as high powered as the designers had anticipated. Never the less, the transmissions were made on 145.990 Narrow Band FM (NBFM) and were relayed on 437.800 Mhz NBFM through a repeater on board the ISS. 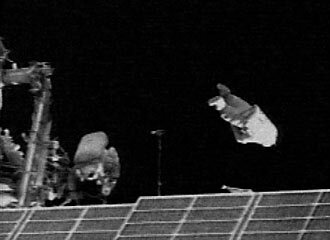 Radio Contact was finally lost on February 18th, and on September 7th 2006 Suit Sat-1 entered the Earth's atmosphere and burned up. 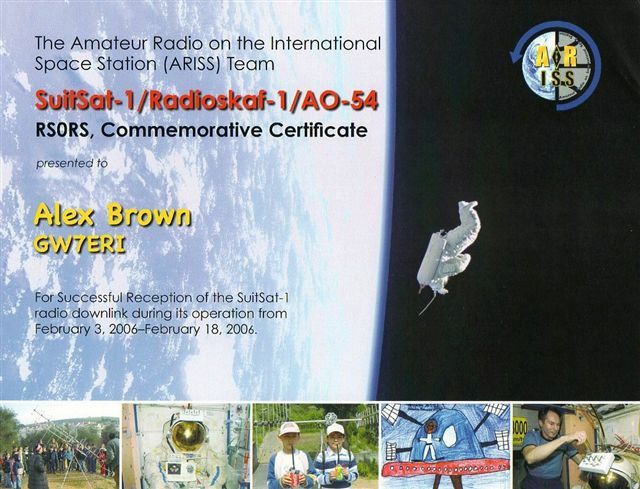 The Amateur Radio on the International Space Station Team (ARISS) issued a commemorative certificate presented to those who confirmed reception of the radio transmissions from SuitSat-1. My sincere thanks go to Gaston Bertles, ON4WF, for his efforts in processing this certificate for me, despite my late application.